What Is a Yo Yo Quilt? 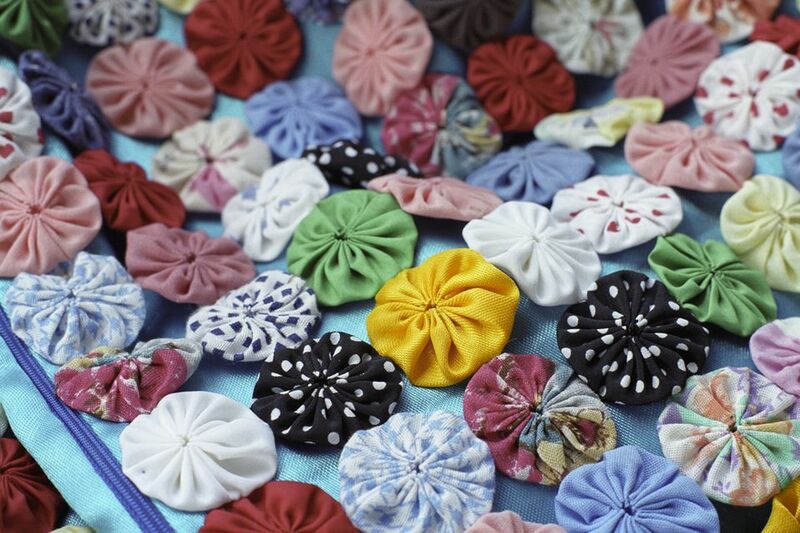 Yo-yo quilts are made from round pieces of fabric with long stitches along their turned-under outer edges. Stitches are pulled to gather the circles into rosettes. Individual yo-yos are typically hand sewn side by side into rows when they are used to make a quilt, but they also work nicely for 3-dimensional appliqué embellishments. Yo-yo quilts were popular in the 1930s and 1940s, and we see lots of lovely examples sewn with fabrics from those eras. Some were structured, with the rosettes arranged to form a pattern, but many of the examples are scrap quilts. It's common to see yo -yo quilts with no quilt batting or backing. Those projects are used as coverlets or as throws. Some yo-yos are connected with a short seam, but others are sewn together more closely to fill gaps, making the circles appear puffed-up, like the quilt shown on page 3. Yo-yos are sometimes attached to a large piece of fabric, which can then be treated just like any other quilt top. The layers of that type of quilt are usually tied, not quilted. Decide how large you want your yo-yos to be and make a circular template twice that size plus about 1/2". Plastic or cardboard templates work just fine, bit so do round jar lids. Several companies, like Martha Stewart, produce special cutters to help you create fabric circles of different sizes. Place the circle template on the right side of your fabric and trace around it lightly with a pencil or chalk marker. Leave about 1/2" between circles. Cut out circles about 1/4" past the line. Thread a hand sewing needle with hand quilting thread, which is more sturdy than typical thread. If you use regular thread, sew with two strands. Knot the end of the thread and bring it up from the reverse side while folding under the circle on the line. The needle and thread should pass through both layers to create a seam allowance. Continue sewing around the circle, folding under the seam allowance as you go. When you reach the starting point, tug on the thread to gather the circle into a rosette. Leave a hole in the middle of the yo-yo. Distribute the gathers and secure the thread with a few backstitches, then make a knot for extra security. Trim excess thread, re-knot and make another yo-yo. You might find that you don't need the marked line to turn the circles under for sewing. Try rotary cutting the circles, but use a special rotary template to help keep your fingers away from the blade. Arrange the yo-yos into rows and experiment with the layout until you find one you like. Align two yo-yos, gathered sides together. Take several whipstitches along one side, backstitching at the beginning and end of the seam to help secure it. Make a knot if you'd like. Repeat, adding more yo-yos to finish the row. Attach rows together in the same way. Yo-yos can be sewn to a large piece of fabric, then sandwiched with batting and bound around the edges. Either quilt or tie the piece. Use yo-yos for dimensional applique – try making an easy throw pillow from a basket quilt block filled with flowers.